← Online Feminism: Who is Listening? When Mohamed Bouazizi, the Tunisian street vender set himself on fire on December 17, 2010, he could not have imagined that his action would lead to a nationwide mass movement in his own country, described as the first revolution in the events known as the Arab Spring of 2011. He could not have at all conceived that his action, followed by his country’s revolution, would become “contagious,” spreading to Tunisia’s North African neighbors Egypt and Libya and beyond. Despite how the events known as the Arab Spring and their complex outcomes have developed and that some have involved a certain degree of civil war as well as international intervention, most entailed large mass protests. In addition, the Arab spring revolutions began as a chain of revolts across several different countries. Each Arab spring revolution was distinct but was constituted, in part, by the regional reverberations of the Arab spring revolutions across national borders. When I was doing my fieldwork in Egypt during the 2011 revolution (or the Tahrir revolution), most of my interlocutors, activists and others, repeated phrases such as these: “The Tunisian revolution was for us a turning point,” and “From Tunisia, we learned that revolutions are real, especially in our part of the world.” One experienced Egyptian activist said, “the Tunisian revolution was the most influential factor that changed the expected number of protesters from tens of thousands into hundreds of thousands and millions.” Yes, each revolt has had its own dynamics, but the presence of these dynamics does not contradict the presence of what may be described as regional “revolutionary fervor.” Has not the time for the scholarship of social movements and revolution to discuss revolutionary fervor and its implications across borders? This post entails some thoughts on this idea. 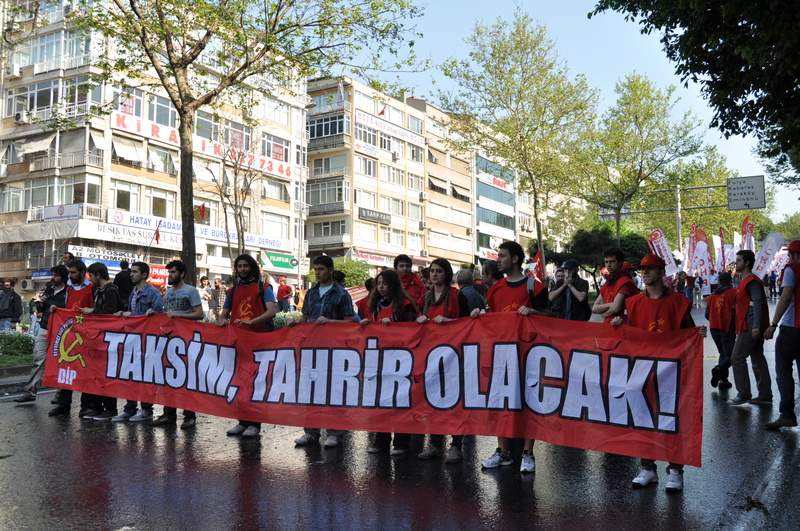 Tukrish activists carrying a banner that reads “Taksim is going to be Tahrir.”Picture was taken in May Day protest that was met by violence from the authorities, one of the early events that sparked Taksim protest later. The transfer of revolutionary fervor across borders is not new. Not only have we seen it within the events of the Arab Spring, but also consider events such as the eastern European revolutions of 1989. Some political scientists have used the concept of “the domino theory” to describe a similar phenomenon, although I am suggesting an alternative conceptualization. The domino theory was a popular concept in the context of the cold war within the conservative circles of the U.S. administration and was deployed within rhetoric about “the fear of spreading communism.” After using the phrase in a speech on April 7, 1954, it became famously associated with President Eisenhower. The domino theory has become a broad theory about “random” connections between a series of similar events and refers to how a change in one context can be contagious to a nearby context. It also seems to refer to random structural level connections between two contexts. But I am thinking about how a focus on the ways that revolutionary fervor can reverberate transnationally might be more suitable for conceptualizing such dynamics. In the recent decade, the sociology of emotions and the study of the role of emotions in social movements and political protest have been growing. The idea of revolutionary fervor expands this body of scholarship in important ways. For instance, while the sociology of emotions may focus more on emotions at the individual level, revolutionary fervor can help us conceptualize collective emotions and this is indeed crucial to the study of the significance of the emotive not only in mobilizing people but also in sustaining, expanding, or shaping revolutions. Consider for instance when a massive number of people become convinced and create enough collective passion to mobilize a protest. This does not negate the fact that individuals experience a political event differently. This is at least what I have been thinking about based upon my fieldwork. In addition, whereas the sociology of emotions has mostly focused on the role of emotions in one specific movement or a distinct revolution, the concept of revolutionary fervor inspires me to think across borders and to consider the connection between the intensely emotional aspects of two or more revolutions, intense emotions that not only connect people but can connect revolutions. For instance, revolutionary fervor can help explain how one revolution might inspire another or when the intense and passionate emotions that have helped to constitute one revolution spill over, shaping aspects of another revolution. Also, there is a great deal of scholarship devoted to the study of transnational social movements. Indeed, the idea of transnationality means something specific when we study revolutions, such as the presence of international solidarity networks, the presence of grievances that concern international affairs, or the borrowing of international ideas, tactics or experiences. Since it is more clear than ever before that ideas and tactics travel within and across nations, why not explore further the significance of political fervor to revolutions, particularly in terms of its transnational quality. The term “revolutionary fervor” indeed names a particular kind of fervor, zeal, or sense of enthusiasm that emerges out of the context of revolutions. Thinking about this concept across borders reminds me of the youth movements and international anti-war wave of 1968. Also, I think of the spread of the 2003 anti-war wave across multiple regions. Also I think of the summer of 2013, and its protest waves in the Middle East and Latin America. And this relates fully to the argument in the Dynamics of Contentions where the authors contend that the rigid separation between social movements and revolutions is unproductive. Revolutionary fervor (and perhaps when thought about transnationally and transhistorically) can help explain one (among many) factors that contribute to the transformation of social movements into revolutions. Revolutionary fervor may also help us think about the idea of borrowing slogans or tactics from one context to another. For example, the tactic of sit-in or occupying a public space is not new as an important repertoire in continuous movements. Remember for example the Greensboro sit-ins in the 1960s, or the occupation of Alcatraz Island by Native American students in 1969, or Harvard Building Women’s Takeover in 1971, all in the U.S. context. But after the Egyptian revolution of 2011, the idea of occupation of Tahrir Square became an inspiration to many protests worldwide. The idea of occupation of a public space took a special powerful meaning from Tahrir and then traveled elsewhere. We saw for example banners in Wisconsin in 2011 describing Wisconsin as Tahrir, or the concept of Tahrir inspiring actions in different European cities, and recently in Taksim’s square when Turkish protesters carried signs indicating that Taksim is Turkey’s Tahrir. Yes, within many protests there has been an attempt to occupy public squares (as a specific repertoire of protest), and this is one thing. Yet it is another thing when an idea such as Tahrir takes on a special meaning and entails and inspires an intense sense of enthusiasm, passion, and emotive energy—a revolutionary fervor–that drives the protest movement and is crucial to its formation and persistence. But what exactly is revolutionary fervor? In the Merriam Webster dictionary, fervor means a very strong feeling, enthusiasm or belief. In many writings about revolutions, we may have seen phrases such as, as the revolutionary fervor eroded, elements of the old regime attacked back, or revolutionary forces were divided, or revolutionary fervor was directed into discussions about power seizing or sharing. This means that it is some sort of intense emotions that climax during a revolutionary time. Revolutionary fervor thus refers to an emotional state, which is related to participating in protest or taking action in contentious politics, and it is a state of collective emotions but also has individual qualities. It also entails primarily positive feelings, as it refers to instigating energy and feelings to protest. We need to study revolutionary fervor in its own terms in specific contexts, and there are many important questions to be addressed here such as for example, how it is instigated in the first place (the triggering event for example), and how it evolves over time? But most of my post here, I am focusing on spreadability of revolutionary fervor. In light of my own interest in the study of the Egyptian revolution of 2011, the “contagious” aspect of revolutionary fervor has twofold meanings. First, I think it can mean inspiration. In the Merriam Webster dictionary, inspiration, among other things, means “the action or power of moving the intellect or emotions,” and “the act of influencing or suggesting opinions.” Studying the idea of revolutionary fervor may mean simply working towards sociology of inspiration in the study of revolutions and social movements. Especially important to my point here, it refers to the spreading of a strong feeling. Second, I think it can be considered transnationally, as a state of what we may call highly noble competition. Based on my fieldwork in Egypt and my close relationship with and analysis of the writings of many Egyptian bloggers and Arabic speaking Middle Eastern activists in the last few years, it seems to me that when activists talk about revolutionary fervor they mean much more than inspiration. One very common meaning I am exploring is that fervor can also mean a state of noble competitiveness between two or more revolutions. This can take this form, for instance: You gave us the idea and inspiration, and we have to be as principled and as worthy to keep it going well and alive. Egyptian bloggers for example made many jokes about the Egyptian and the Tunisian revolutions, as if the two revolutions were participants in a game to see who would achieve more accomplishments in a particular amount of time, in a state of a very noble competition. As I started above, revolutionary fervor (in one context) refers to a state of intense emotions, and it is mostly collective and involves positive energy for participating in protests in a revolution. But when revolutionary fervors spread, this involves another element, which is its relationality. This concerns the fact that it concerns (at least) two revolutions, or movements: one that is ongoing or already happened and the other is emerging. The relationality here means primarily sending strong positive feelings, from one place to another. But we cannot deny that negative feelings do exist in this case. The case of defeat of an inspiring revolution will definitely negatively impact all those who inspired by it (although this is beyond the scope of revolutionary fervor). It may be difficult to study revolutionary fervor, but so is the case with emotions in social movements and protest. This requires hard ethnographic work, participant observations and many open-ended interviews. It is especially difficult because it is collective and also has individual quality. It seems even more challenging to explore its reverberations transnationally and transhistorically and the implications of such reverberations for the shape and direction of distinct revolutions. Of course there are many interesting questions that need to be explored and investigated related to this concept. One of them is the reasons and or the conditions instigating the revolutionary fervor. In other words, what makes the revolutionary fervor emerge and become spreadable? To think concretely, in the examples of the eastern European revolutions of 1989 or the Arab spring in 2011, is the presence of a prerequisite relation between two sites/contexts (geographically neighbors in Europe and ending communism, and or being Arab and share geographical, cultural and political conditions) necessary to enable the fervor? This may not be necessary, but it is worth thinking about. 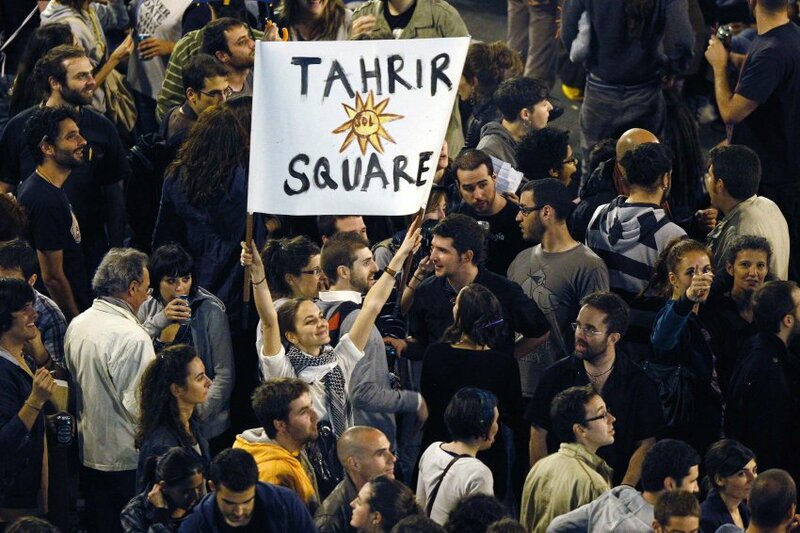 The fact that Tahrir Square became a global inspiration is a reminder. Studying revolutionary fervor will broaden our understandings of revolutions and social movements, which are often limited to questions of individual or collective grievances, resource mobilizations, and/or structural revolutionary crisis/situation. It may even lead to new ways of thinking about the classical idea of critical mass participation in protest. Why not explore revolutionary fervor and how it spreads? Thank you for your comments. This is really useful. This will help me in developing the idea further. I agree with you totally that, despite the fact that the term is useful, it may be already studied under different names, and also it overlaps with different ideas in sociology and the political psychology of the crowd, etc. Thanks again.